The T-62M-1 is a Rank VI Soviet medium tank with a battle rating of 9.0 (AB/RB/SB). It was introduced in Update 1.79 "Project X". The T-62M-1 is very much similar to the premium T-55AM-1, with distinctive metal-polymer composite add-on armour on the turret cheeks and within the upper frontal plate. Though the latter is often inadequate in dealing most-all ammunition it faces, the turret armour on the T-62M-1 is twice as thick as that found on T-55AM-1. In fact, most of the turret( aside from the gun mantlet) is impervious to most kinetic penetrators, vulnerable mainly to the Type 90 and AMX-40's extremely high penetration rods. The T-62M-1 also has wet ammunition storage bins. 24 rounds are placed within the fuel tank located beside the driver, acting as a spaced armour, protecting the ammunition from HEAT. In fact, rounds within the fuel tank are extremely unlikely to be detonated by HEAT. The T-62M-1 should be played like other high tier Soviet MBTs, though with an higher emphasis on range and cover. Hide your hull and use your almost impenetrable turret armour to deflect hostile fire. If possible, try to use cover to conceal your cannon breech, as a well-placed APFSDS can disable your cannon and, depending on which side of tank you were hit from, kill your gunner or loader. A turret penetration may result in a one-shot kill if it hits your ammo. Do not allow yourself to fall into close-range combat areas if at all possible. Those who have fought and/or used the T-55AM-1 will find the same tactics and assumptions work against the T-62M-1, as well. 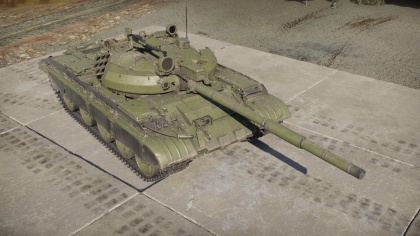 It performs similarly, mostly just having upgraded the strengths the T-55AM-1 is known for; the turret armour is even better, and the power of the variety of rounds these tanks are known for has been increased, thanks to the increased calibre of the cannon (from 100mm on the T-55AM-1 to 115mm on the T-62M-1). This allows the T-62M-1 to have ways of dealing with vehicles all the way up to 10.0. Thanks to the incredible turret armour, and highly effective and varied ammunition choices, the T-62M-1 is highly suited for a long-range sniping and support role. Players of tanks such as the Chieftain will have an idea of the playstyle. Use your fast and powerful APFSDS rounds to quickly disable targets travelling quickly at ranges out to several kilometres, use your potent HEAT-FS to dispatch targets at closer ranges, or fire the breech-loaded ATGM for highly accurate shots against exposed targets, both ground and air (especially against helicopters). Try to avoid close-range engagements at all costs. The T-62M-1 suffers in almost all regards compared to other tanks at closer ranges. Compared to other common tanks, such as the XM-1 (GM), the T-62M-1 has a far longer reload, worse acceleration and top speed, a larger and slower turning circle, and a poorer turret traverse speed. If you get caught out, try to take quick shots to disable the mobility of enemy tanks if you cannot out-right kill them, and make your goal of upmost importance to leave the area immediately. Use your smoke launchers to hide your retreat, and cover your upper frontal plate at all costs; a penetration on the left side of your front plate will spell instant death. Beware of high tier American MBTs, as their mobility allows them to easily flank you and get a shot into your weaker side armour. The Type 90 and AMX-40 also pose a grave threat, as they can easily penetrate your turret armour and cripple your tank. Your tank also has a large amount of weak-spots from even the slightest angle above you, so make sure you take enemy helicopters seriously and deal with them as fast as possible. Your gun elevation isn't the greatest, so make sure you use terrain to help lift your gun as well as present thicker armour profiles. The T-62M-1's core strengths lie in the frontal armour and versatile ammunition choices. Do not attempt to out-snipe a T-62M-1 in anything short of a hull-down British MBT. Instead, abuse the T-62M-1's inferior mobility to out-flank it and quickly disable the gun. At closer ranges with higher penetration shells (260mm+ penetration, chemical or kinetic), shooting the cannon breech can also serve to turn the T-62M-1 into an easy kill. If you're engaging a wary T-62M-1 at closer ranges, try to bait out a shot or wait until he fires. 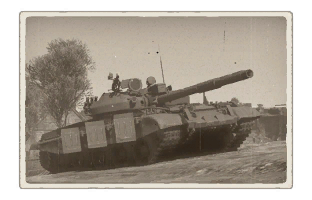 The T-62M-1, depending on crew skills, has a reload of up to 12 seconds, giving a smart opponent plenty of time to take out a T-62M-1 after he fires. Using smoke to hide a quick change in your position can also work well, as both the T-62M-1 itself and its turret turn slowly compared to vehicles it will face, giving you time to drive around it in the confusion. By the early 80s, the USSR began deploying new tanks: the T-72s, the modernized versions of the T-64, and its derivatives, the T-80s. However, the country also had a rather large fleet of "old-school" models that were no longer a match for the newest tanks but still possessed some modernization potential. So, in 1981 the government approved a project on the complex modernization of the T-62s. The aim of the project was to upgrade the defenses and augment the tanks’ firepower. Following several radical design changes, the tank’s combat effectiveness – despite the resurfaced issues and substantial age of the model – was significantly increased, putting the modified T-62M-1 on the same level as the third-generation tanks. [Devblog] Т-62М-1: the fight continues! This page was last edited on 9 March 2019, at 06:08.